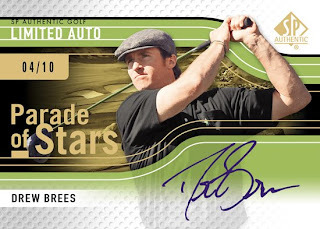 Many collectors will agree that redemptions are a serious problem within the hobby. 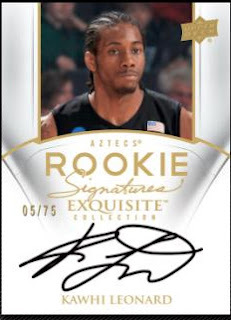 The companies are excited to include a player in the auto checklist only to get put in to a position when the player does not return the cards/stickers in time for pack out. 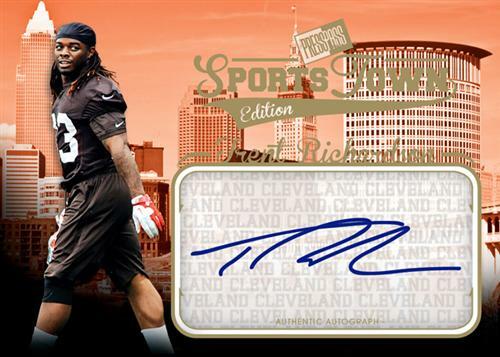 Sadly there have been situations where a player eventually skips signing the cards or even has someone else sign for them (we all know it happens no matter what the card companies say). 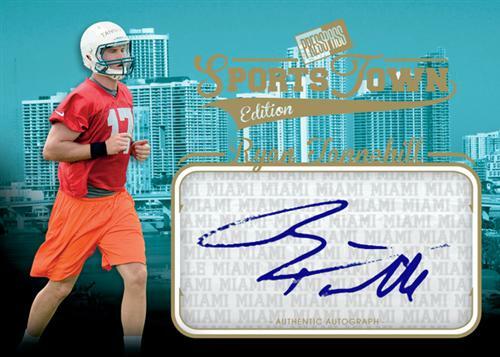 I remember last year hearing about an athlete losing a stack of autograph cards, which could lead to a whole new problem if it happens more often. 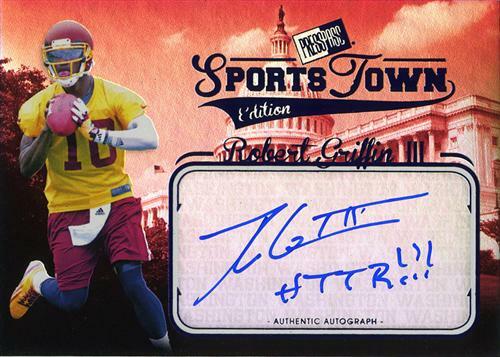 Not that redemptions are going anywhere any time soon, they are a part of the hobby now just like sticker autographs. While these problems could be relieved by companies not including players on the checklist unless they can ensure the player will sign before the release date or have the autographs in hand before adding them to the checklist but at this point it seems to be a useless argument on our end. But recently we have seen attempts by a couple of the companies to make amends with the collectors who support them. Leaf if one of those companies. 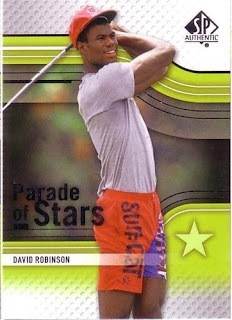 It has been noted before that Leaf has worked hard to ensure that all autographs are packed out but obviously it is not always possible and they realize this so with the upcoming 2012 Leaf Metal Draft Baseball release that comes out next week they have set up what is being called “Hot Redemptions”. To compensate collectors who will pull a redemption card they have set up a program to reward the collector with up to 5 signed cards from the particular player. If you do pull a redemption you sign up through their redemption link at Redeemleaf.com and key in the info and you will see a virtual online pack that you get to open and you will immediately see what you will receive for the redemption. I know it does not fix the redemption problem but it helps if you know you are getting five autographs from Carlos Correa or Mike Zunino instead of just one card. Though the down side is that if the autographs get delayed then you are waiting on five autographs instead of one. 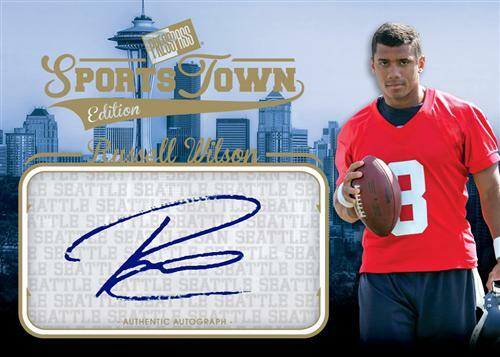 At the end of October Press Pass will be releasing their third straight single pack per box product, Sports Town Football. Showcase and Fanfare were the other two releases that were single pack per box products and each had a niche with Showcase doing a bit better because the more unique design using acetate not to mention a number of the autographs had personalized signatures and inscriptions. 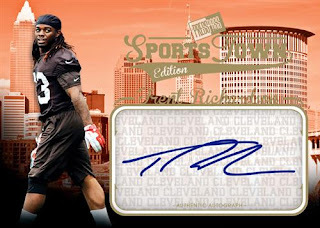 These two products were also released prior to the NFL season so collectors were still chasing down the first autographs of their favorite draft picks. By the time that Sports Town is released on October 31st the season will be entering Week 9 and there will be roughly 15 NFL-licensed products available, 2 Upper Deck NCAA-licensed releases plus 7 Leaf football related products and 4 Sage products all available for collectors to purchase. 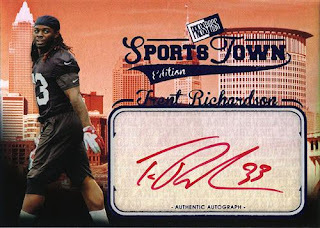 The landscape will be very different when Sports Town makes it to the shelf, it will be much more difficult to grab a collector’s attention over a licensed product. Press Pass decided to go in a gimmick route, sort of; they have infused the player’s picture with a picture of the city skyline where the team is located. Hence the name “Sports Town”, it focuses on the player’s location. Some of the skyline’s are more recognizable like Seattle’s Space Needle (I miss Seattle so much some days) behind Russell Wilson and the Capital Building behind RG3. The skyline is slightly muted to put the attention on the player and it is hued to the team’s colors. Because Press Pass does not have a NFL or NCAA license all of the pictures appear to be from training camp or practice shots. A huge bonus is that all of the cards are on-card autographs with some containing inscriptions. 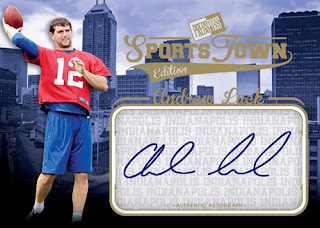 Each 1 pack box (4 auto cards per box) runs around $70-75 and the entire set is made up of a 50-card autograph checklist. 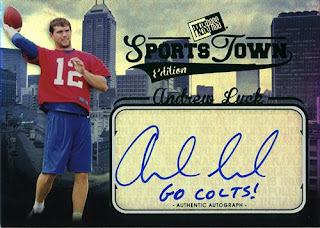 Only the top drafted players were selected to be included in the set and I believe that each team is represented by at least 1 player with some teams, like the Colts, having as many as 5 individual cards (Luck has 2 different cards, Dwayne Allen, Vick Ballard and Coby Fleener). 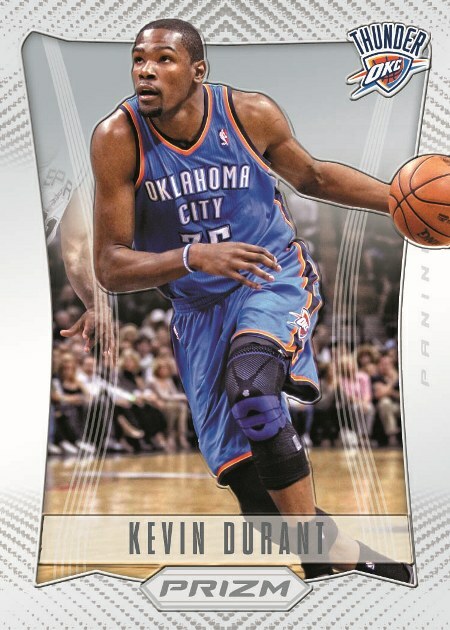 I noticed that some of the cards appear darker than others or the foiling appears different, the differences can be seen with the Luck and Richardson cards, I am not sure if these are variations, parallels or just a difference in the way that the cards were scanned in when initially posted on the sales materials. 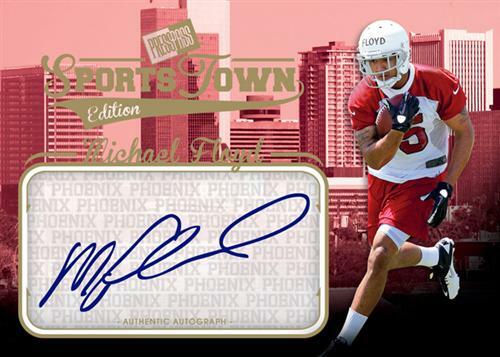 There are some obviously differences with inscriptions and ink colors plus the Luck card with him in a red jersey is listed as a variation on the sales materials. 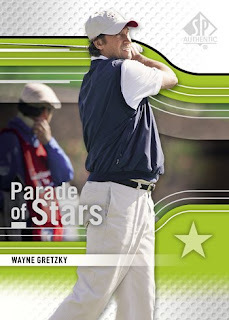 Upper Deck released 2012 SP Authentic Golf earlier this week, their first PGA release since 2005, and one subset that is catching collector’s eyes is the Parade of Stars. This is a 30-card subset showing professional athletes playing golf. 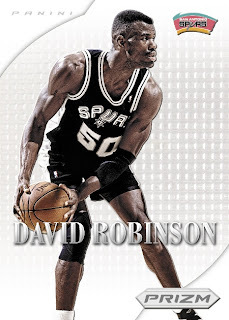 The checklist includes top athletes (Current and retired) from the major sports leagues: MLB, NBA, NFL, NHL, MLS and UFC. 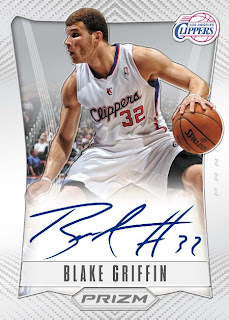 There is also a 14-card autograph subset which is based on the same checklist but uses a different layout, design and athlete picture. 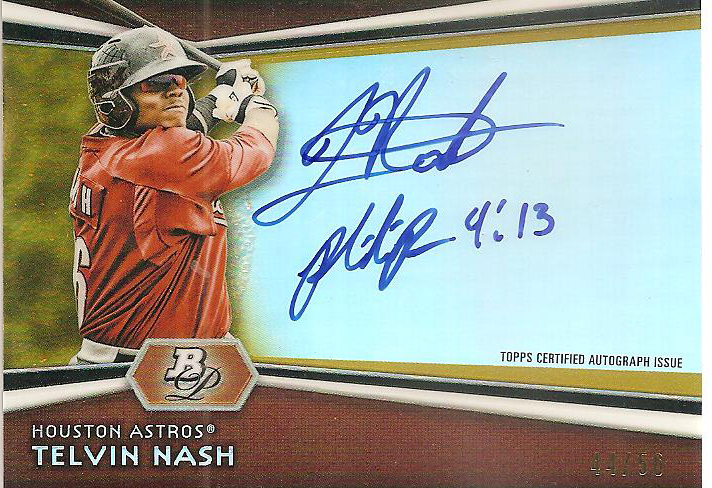 There are Red parallels (#/10) for each base card and the autographs are all on-card. From the auctions that I have seen it looks like only Mike Schmidt autographs are redemption with all others autos being packed out. 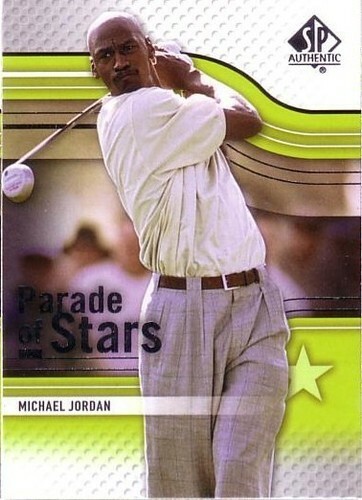 Most of the Parade of Stars base cards can be found in the $1-5 range with many of the autographs under $50 with the exception of Jordan, who has a couple of autos sitting in the $3,000 range. 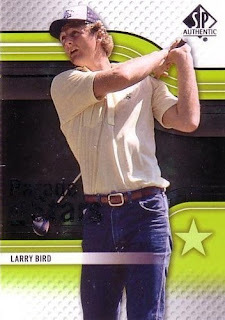 A couple of cards use old photos, David Robinson and Larry Bird, while others appear to be set studio shots, Couture and Dr. J are wearing the same exact shirt (The color defect under the arm is pretty obvious) but these things do not detract from the set, you may actually get a nice chuckle out of the Admiral’s old-school clothing selection. 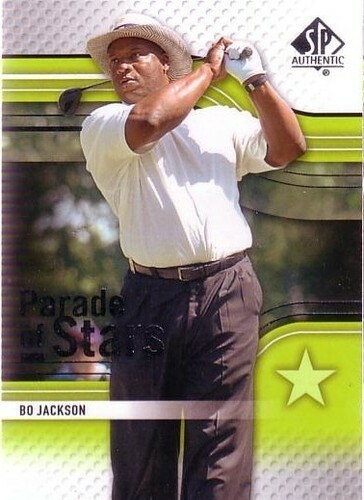 I have played golf a handful of times so golf sets do not appeal to me but when you begin to introduce outside athletes in to a product this is a good way to get the hobby talking about it. 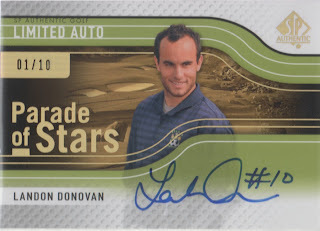 There are a couple of cards I would consider adding to my collection, like the Couture and Donovan cards. This dates back to Pacific’s Prism releases from the mid-90s. Pacific was one of the early runners to introduce the super-foil/reflective cards and Panini is bringing it back in to rotation with 2012-13 Prizm Basketball. As I pointed out recently I am not on-board with all of the releases of the heritage and retro sets because they do not always do proper justice to the original. 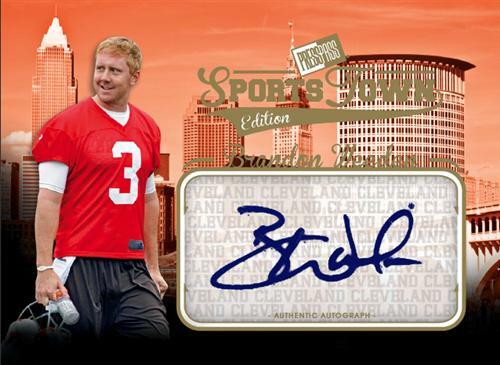 My case in point would be Panini’s Signature Series taking on the Leaf Studio sets from the 90s, Panini got that one wrong. Right now I am holding judgment on this release until I get my hands on a pack or two to see it up close. 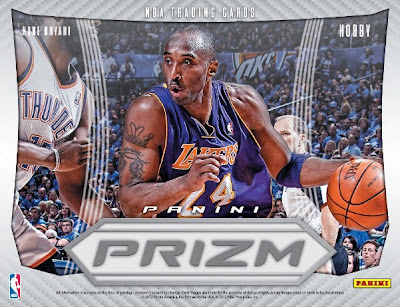 The Prizm base set checklist is made up of 300 cards, including 100 rookies (from 2011-12 and 2012-13). The base cards will have two parallels, a Prizm parallel and a Gold Prizm parallel. Note that Panini's basketball releases this year contain Double Rookie Class rookies from both the 2011-12 and 2012-13 NBA Drafts. There are 4 insert sets; Autographs, USA Basketball, Most Valuable Players and Finalists. 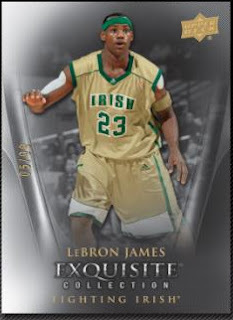 Upper Deck has finally released sales materials for the upcoming 2011-12 Exquisite Basketball set, scheduled for release October 16th. Pack out and a price point has not been announced yet other than there will be 5 autographs in each box with at least one auto being from the Upper Deck Black line and every autograph is on-card. 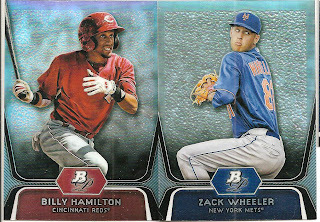 Sorry about the picture quality of some of the cards, I pulled them directly from Upper Deck's Power Point sales materials. This is a college product so all players are shown in their college uniforms and autograph sets are college related and while this may bother some people it is actually not that big of an issue. 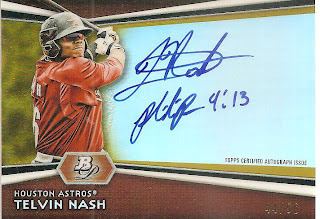 Base cards are numbered to #/99 and All Rookie Autographs are numbered to #/199 or less. There will be multi-signed cards ranging from the quad-signed Endorsement (#/5 or less) all the way up to the Exquisite 12 booklet cards, which contain 12 player’s autographs (1/1). 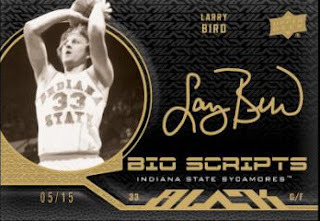 Upper Deck has worked in a collection of new inserts like Championship Bling cards, a card designed to highlight players who have led their college team to a title. These cards are horizontal and include the player along with a replica ring-face and are signed in gold ink, which stands out beautifully on the black card and accents the gold ring nicely. 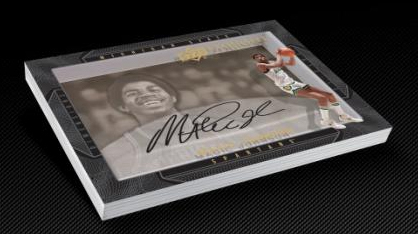 The Exquisite Dimensions cards have made their way over to the basketball product and are very similar to Shadowbox cards. UD Black is well represented with three separate inserts; Coaches Blackboard, a set highlighting NCAA coaches, Bio-Scripts and Autograph Patch cards. 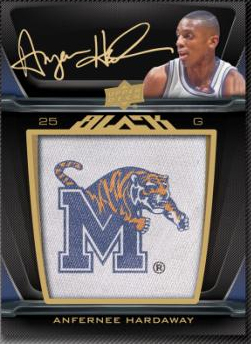 I am guessing that the patch cards are manu-patches. NFL Refs Blow It Seriously! I am a Seattle Seahawk fan, I have been one my entire life and as much as I love to see them win I hate to see them win on a blown call by scab refs. I have been steadfast in my belief that Pete Carroll needs to be fired and even with the team 2-1 in Week 3 I still believe that the man should be shown the door. He called a piss-poor game, who in their right mind runs down the clock with 2:12 left in the First Half? He seriously ran a handful of running plays and let the clock wind down with the Hawks up 7-3 instead of actually trying to pass and increase that lead. Instead he walks away with a cheap win and he probably will not see it that way and consider it a solid win because of his coaching but 99% of the football watching-world see this as what it is, a serious game turning blown call by the refs at the end of the game. What is worse is that the final minute of the game was horrible calls, there were 4 straight flags during the Seahawks final series including a blown call for Defensive Pass Interference when Sidney Rice was clearly pulling on the defender before the ball was in the area. It should have been a no-call, Offensive Pass Interference or off-setting penalties at worst. This allowed the Seahawks to keep moving in to position to force the refs to make a game winning (horrible) call. When the ball went up for grabs there was not one but two blown calls that turned the game. The first was Golden Tate pushing off a defender before he went up for the ball, this should have been a Offensive Pass Interference and the game should have ended on that but it got worse when there was no question that Jennings had the ball. He came down with the ball in his arms and Tate was able to wrestle it away from him. What is sad is that one ref was waving his arms to signal an interception while a second ref signaled touchdown. I know that some (as I would expect Carroll) may argue that Tate and Jennings had simultaneous control but seeing replay after replay and this was not the situation. Jennings had the ball plain and simple. As a Hawks fan I am saying, this game should have ended with an interception and a Packer's win and the Seahawks being 1-2 with Carroll sitting on the hotseat for his crappy game plan through the first 3 weeks. The laughing you are hearing is from the NFL Official's Union as their leverage over Roger Goodell increases. A MNF game ending in this manor was probably the worst thing that Goddell could have hoped for in the middle of union talks. "From what I understand from the officials, it was a simultaneous catch, that's how they called it," Carroll told reporters. "Tag goes to the runner. Good call." Is that seriously his response? He clearly has not watched any of the many many many replays on every channel showing that Jennings had the ball or that Tate has pushed off Sam Shields while the ball was in the air. He is completely oblivious to things he does not want to deal with. "I don't care, I could care less about all that stuff. The game's played, they called it. We played with the officials they sent out there, we played with the team that they put out there, and at the end of it, we throw the ball up and Golden makes an extraordinary effort." This POS continues to act as if the game was not decided by a poor call, he seems to feel as if the game was called fairly and that the game ended without a question. The other day Derek Jeter reached another milestone in his storied Yankee career; with his leadoff single in the first inning of Wednesday’s game against the Blue Jays he reached 200 hits for the season. This makes Jeter’s 8th career 200-hit season which ties him with Lou Gehrig for the most 200-hit seasons by a Yankee. I felt that this feat was deserving of a Gehrig Vintage Card of the Month. 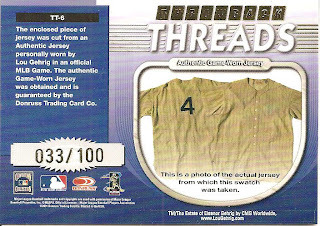 The card, while not vintage, does include a sweet Gehrig jersey relic so I am giving it a free pass to be inlcuded. This month’s card comes from the non-vintage 2001 Donruss Elite release, specifically from the Throwback Threads relic inserts. As a Gehrig fan I am always on the lookout for a well-designed Gehrig card, anything to add to my personal collection. I love the early 2000s Donruss Elite releases, I think they were some of Donruss’ best designs and the Throwback Threads relics are one of my favorite memorabilia inserts. 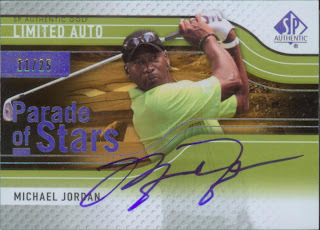 This card was one that I have had on my want list since it was released in 2001 and a couple of years ago I finally was able to pick this one up in the $150 range. I don’t think I could have found a better specimen. The pinstripe along the left side of the “T” makes this card a beauty in my eyes. 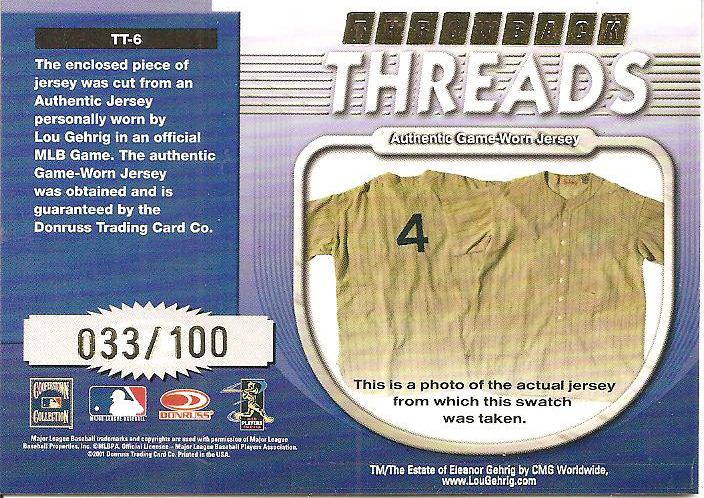 I like that Donruss included pictures of the specific item that the relic was cut from, in this case his jersey. 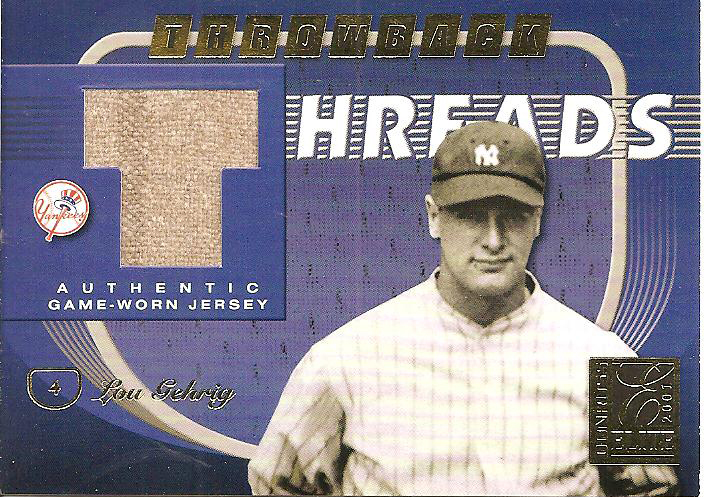 This was my first, and currently only, Gehrig relic card. 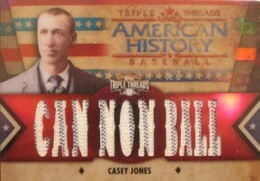 2012 Topps Triple Threads Baseball is now live and like last year Topps has gone the gimmick route and continued the American History relic cards. Last year we saw 2 mythological folklore characters, Pecos Bill and John Henry, along with Norse/Viking explorer Leif Ericson though I am not certain how Ericson is directly connected to American history because he landed in what is now part of Canada. 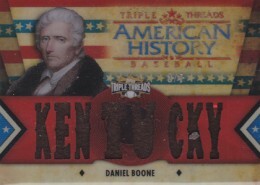 This year Topps did go with three real personalities that are part of American history with Davy Crockett, Daniel Boone and Casey Jones. 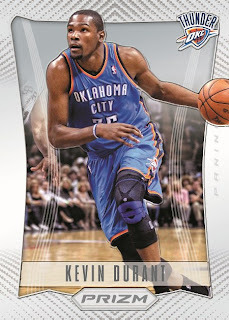 These cards are considered bonus cards, so they are not taking the place of a guaranteed hit. 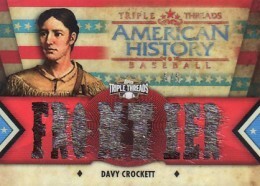 Currently there is a Davy Crockett card up for auction at $599.99 with 2 declined offers. 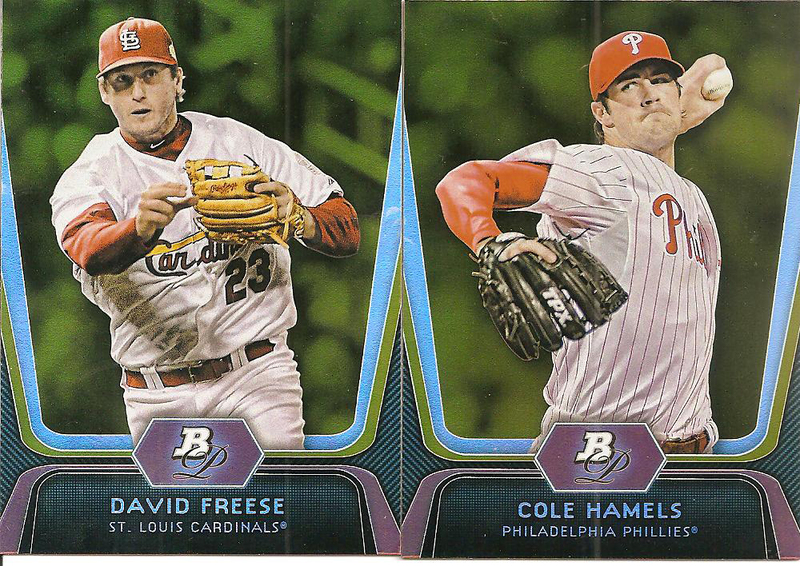 Recently a Daniel Boone card and a Casey Jones card sold for $175 each. There is also a 2011 John Henry card up for auction at $30.01 with 3 days left. Some times when it comes to a hands on review I can be a procrastinator. Often times I pick up a pack or box and will set it to the side for a while before opening them. I just get side-tracked and once something is out of sight it is just as quick out of mind. Then there are times where I open up packs and set them next to my computer with the intent of doing a review but will start writing about other hobby news and my pack reviews have to wait. Right now I actually have three stacks of packs waiting for a review sitting next to my computer so I decided it is time to buckle down and start the reviews. 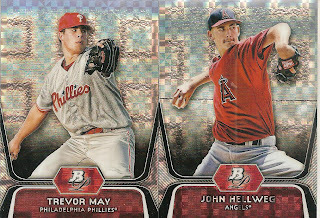 First up are a couple of rack packs of 2012 Bowman Platinum. I was not a fan of the Platinum products when they first hit the shelf but over the years I have found an affinity for the products. The product has changed from year to year so that may be the reason for my change of heart. 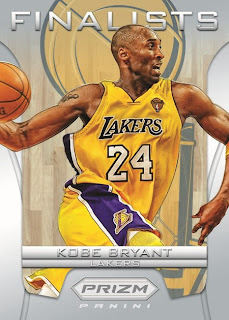 Each rack pack contains 3 packs with 4 cards each and 3 retail exclusive Purple parallels. 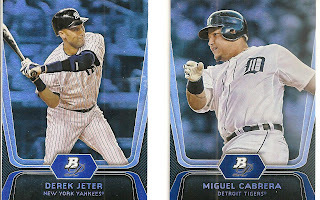 The 2012 Bowman Platinum Baseball set is pretty small containing only 100 base cards. The parallels for the base cards are Gold, Emerald and Ruby. The base checklist includes a nice mixture of veterans (Ichiro, Jeter, Chipper Jones and Cliff Lee, etc. ), young players (Michael Pineda, Mike Trout, Justin Morneau, David Price and Andrew McCutchen) and rookies (Yu Darvish, Bryce Harper and Yoenis Cespedes). 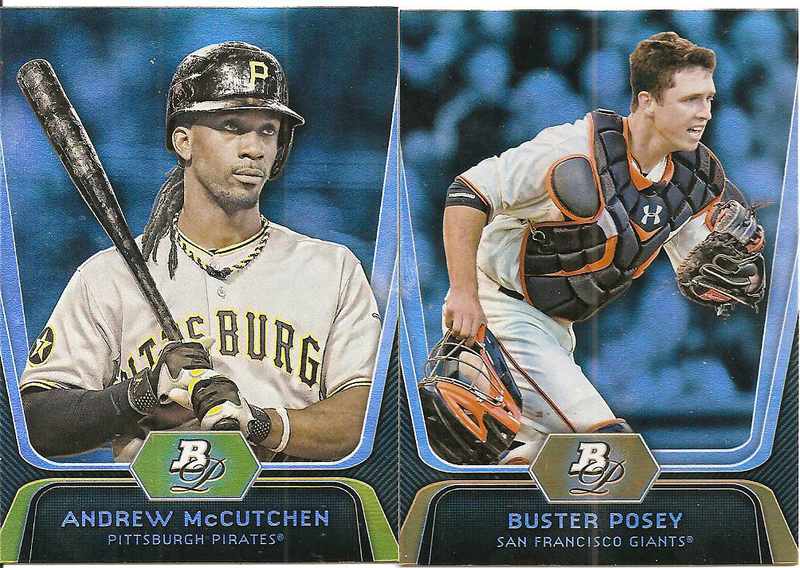 I pulled some nice base cards from these packs. I was able to get three of the top five AL pitchers as well as 2 of the top five AL batters. 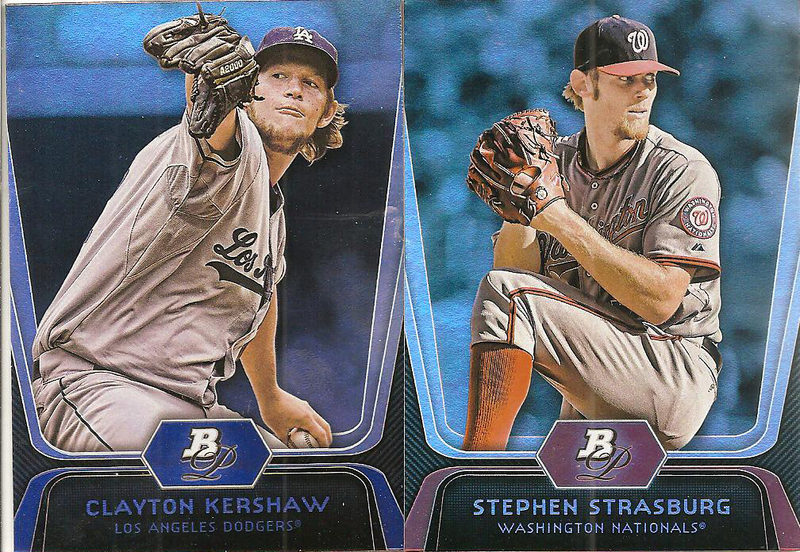 With the NL counterparts I grabbed 2 of the top NL pitchers and two top NL batters. 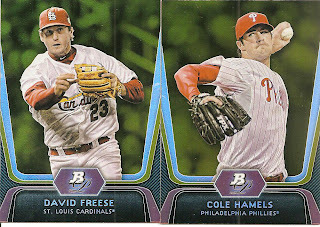 Toss in David Freese and Cole Hamels Gold parallels and a Prince Fielder Green parallel. The Bowman Platinum Prospects, also a 100 card checklist, includes a larger selection of parallels, all refractors; Refractor, X-Fractor (1 per hobby box), Green Refractor (#/399), Blue Refractor (#/199), Gold Refractor (#/50), Red Refractor (#/25), Atomic Refractor (#/5) and Superfractor (1/1). One thing Bowman is known for is offering up a large selection of prospects. Some go on to stellar careers, some have solid careers and some end up selling shoes in a couple of years. This checklist is made up of players who will probably fit in all three categories. The big names are here led by Bubba Starling followed up by many Machado, Trevor Bauer and Gerrit Cole. Embarrassing as it is, I have to admit that there are some names I do not recognize on the checklist but I do not always follow prospects very well. Interestingly you will notice a slight difference between the base cards and the Platinum Prospects cards. 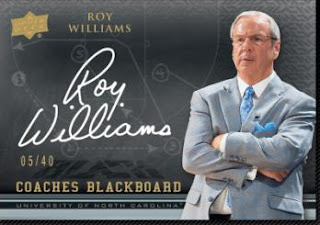 The design is very similar with the player's elements standard but the base card has the player's name/team over a black background with a team color border, the Prospects are reversed with the name/team over the team color background and a black border. 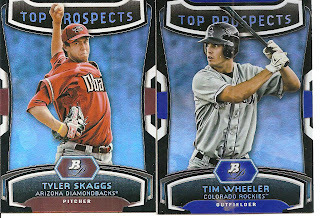 The etchings along the side/bottom are over a black background on the base cards and over a silver foil background on the Prospects cards and finally the border up the side on the base cards is missing from the Prospects cards. 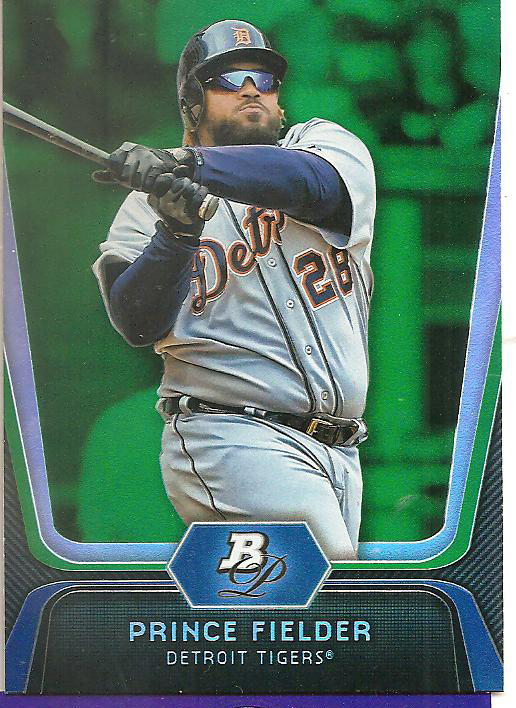 I also noticed, at least with the cards that I pulled, that the base cards use images of the players that seem closer where as the Prospect cards use player images that appear further back thus showing more of the player's body. 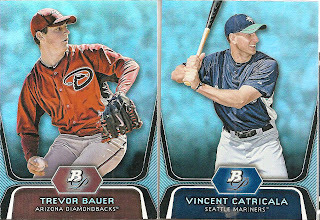 My Prospects were a little less exciting; Trevor Bauer topped my list as well as Vincent Catricala from the Mariners. 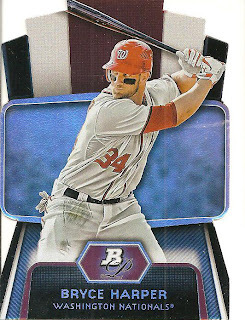 With each rack pack containing 3 Purple Refractors I pulled 6 total led by Gerrit Cole. 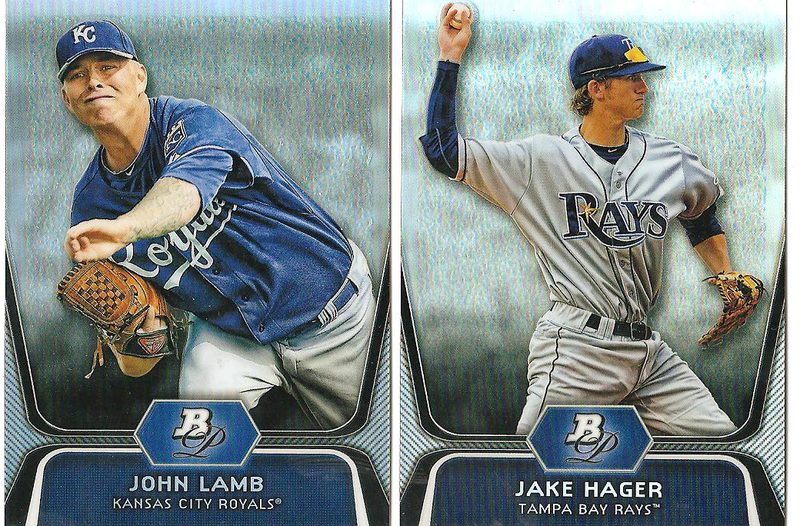 Wil Myers and Jordan Swagerty have some nice potential too. 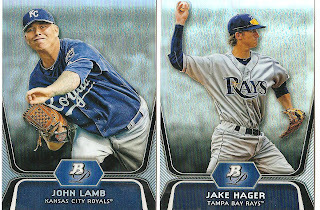 I pulled 4 refractors, all pretty much mediocre players. I was surprised to pull two X-Fractors because they are listed as 1 per hobby box (1:20 packs). 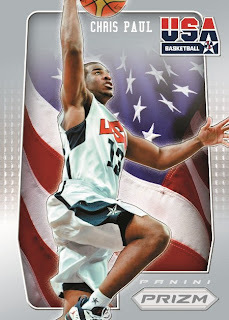 Has anyone else come across this from rack packs? Sadly, they two are pitchers who together may make it to just about a .500 win percentage and an ERA just north of 3.70. 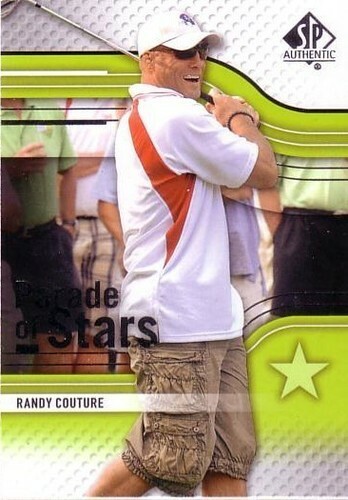 Not really someone I would expect as a prospect, unless his prospect was his ability to sell shoes alongside Al Bundy. 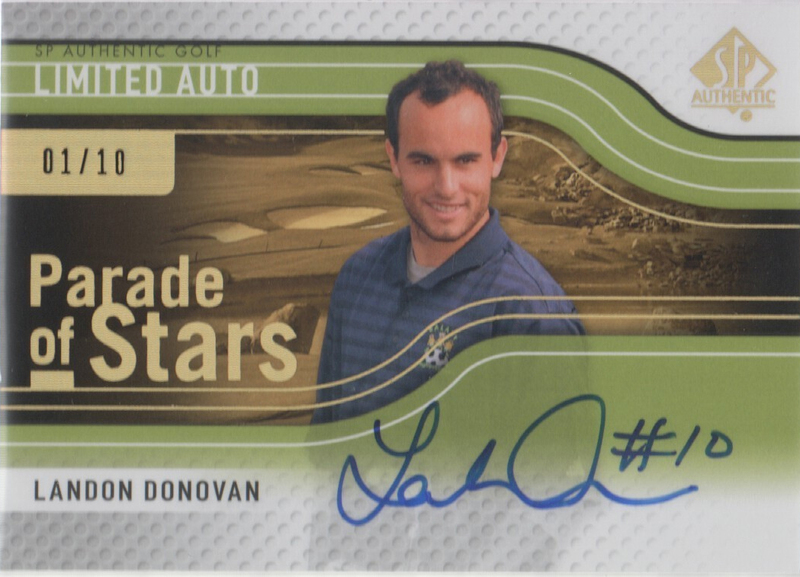 Not that I am complaining, but when the odds are 1:1,029 packs (For the Gold Refractor parallel) to pull an Autograph Prospect you would think that the checklist would be more solid. There is no reason to force 44 players in to a checklist, especially if those players may never be a true prospect.